Peter was born in Europe to parents that were born and raised in Poland and emigrated west soon after World War II. Peter’s mother, Alina Zeranska, wrote The Art of Polish Cooking in 1968, which served as the foundation of the family’s love for Polish food. Laura married into the family in 1973 and learned to cook Polish dishes from her mother-in-law. As Peter’s parents grew older, Laura took over the preparation of hundreds of Sunday family dinners and special holiday celebrations such as Christmas Eve and Easter. The recipes she prepares today are essentially the same as those prepared in Poland by Peter’s grandparents, great-grandparents, and great-great-grandparents. 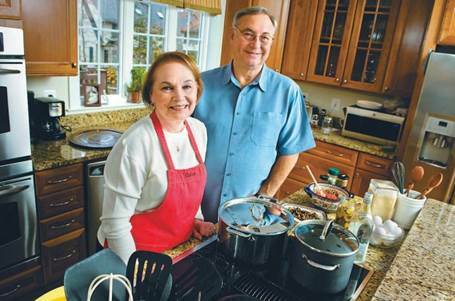 Peter and Laura authored two very popular cookbooks: “Polish Classic Recipes” and “Polish Classic Desserts” (which won the Gourmand Award Winner – 2013 Best Eastern European Cookbook in the U.S.A.). You will have a chance to meet with Laura and Peter on our POLcast every two weeks – they will be talking about Polish food.